The procedure in this section applies to Chef 12 and newer stacks. For information about how to add apps to layers in Chef 11 stacks, see Step 2.4: Create and Deploy an App - Chef 11. The Apps page is displayed. Choose Add an app. The Add App page is displayed. Choose Add App. 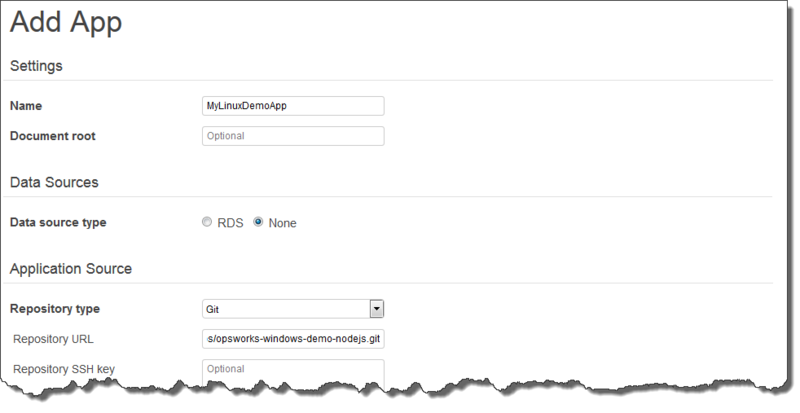 AWS OpsWorks Stacks adds the app and displays the Apps page. You now have an app with the correct settings for this walkthrough. In the next step, you will launch the instance.